"He loves to paint," Ron says of Metro Meteor. Metro Meteor's owners posted the following update to the popular OTTB's Facebook page Monday morning. Stakes-placed “Metro” became famous for his interest in painting alongside owners Ron & Wendy Krajewski, who cared for the horse after he left the racetrack and developed a degenerative knee condition. 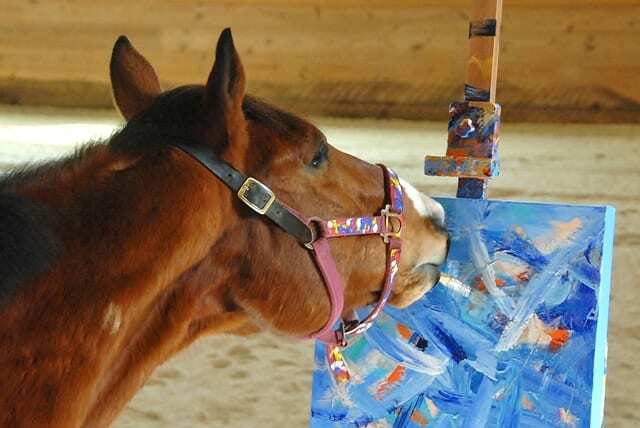 Metro paintings were sold to benefit Thoroughbred aftercare charities and to help pay for experimental treatments to keep the gelding sound. Metro's efforts to help other horses attracted national media attention throughout the past six years and inspired Ron Krajewski to write a book. We had hoped that a new farm with greener pastures would be good for Metro, that maybe different pollen counts would help lesson the constant flare ups of uveitis that had taken away his eyesight. But as the day approached for the move, it became clear that with Metro's rapidly declining health and his anxiety levels with his loss of eyesight, a move would do him more harm than good. We decided to keep him in Gettysburg. Through long talks with Metro's veterinarian, we realized that Metro's quality of life had become drastically reduced and he was living in constant pain. The medications we had to give him to treat one aliment were causing new ailments. There was no way to win, and nothing more we could do for him. Even though he had lived five years passed his original prognosis, and had overcome every obstacle he faced, Metro just had too many obstacles now, and was losing the battle. The heartbreaking decision was made that it was best for Metro to let him go. Metro was humanely euthanized on March 28 by his vet and longtime friend, Dr. Kim Brokaw. Metro was 15 years old. Metro came into our lives ten years ago with an expiration date. With all of his health issues, we were told that we would have to say goodbye to him sooner rather than later. When Metro stepped off that trailer ten years ago, he wasn't the horse we had hoped for. But he turned out to be more than we could ever dream of. Metro's last days were filled with apples, oatmeal cookies, and hugs and kisses from the people who loved him. Painting saved Metro's life. Back in 2012 Metro was only given year left to live due to detrimental bone growth in his knees. He was taught to hold a paintbrush on a whim, as something that would keep him active and a way to spend my remaining time with him. Who knew that Metro would take his new found talent and soon become an ambassador for racehorse adoption and one of the most famous horses in the world. The money raised from his paintings financed an experimental treatment with a drug imported from Europe that would add five more years onto his life. Metro lived long after his expiration date and defied expectations. We are devastated by his loss, but thankful for every minute we got to spend with him. We were by his side to the very end. What Metro did with those five additional years is a story ripped straight from a Disney movie. His story and message for racehorse adoption was a constant in print and on television. Metro made appearances on the Today Show, Good Morning America, The BBC, People Magazine, the New York Times, NPR, and countless other news organizations. Metro brought the message of racehorse adoption to millions of people across the globe. He and his artwork personally raised over $80,000 for New Vocations Racehorse Adoption Program. He was the crippled racehorse that no one wanted, but he was amazing. He was a clown. If you walked into a barn filled with 20 horses, you would immediately know which one was Metro. He made his presence known. He greeted every visitor with a nicker, and whinnied back when you called his name across the field. His rambunctious attitude and health issues were a constant challenge, but we never gave up on him and he rewarded us by taking us on his amazing journey. He was truly a special horse. Most people dream of leaving a legacy, of being remembered long after they are gone. Metro will live on in the hundreds of paintings that hang in homes all over the world, and the hundreds of retired racehorses who now have a second career and loving home as a direct result to Metro's artwork and message. Metro was cremated and his ashes will be prominently displayed, along with his paint covered easel in my art studio, where he will continue to inspire and paint beside me. Even though Metro's amazing story has come to an end, the story of retired racehorses continues. Hundreds, if not thousands of them every year need second careers and loving homes after their racing careers have ended. You can keep Metro's mission alive by going to New Vocations Racehorse Adoption Program and leave a small donation (or a huge one) in memory of Metro. This entry was posted in Horse Care, NL List and tagged metro meteor, New Vocations, OTTB, painting racehorse, uveitis by Edited Press Release. Bookmark the permalink.